The 2017 Jeep Compass is everything you want in an off-road prowler – it’s capable, high-tech, and affordable. You won’t find a better four-wheel-drive performance in the small crossover segment. 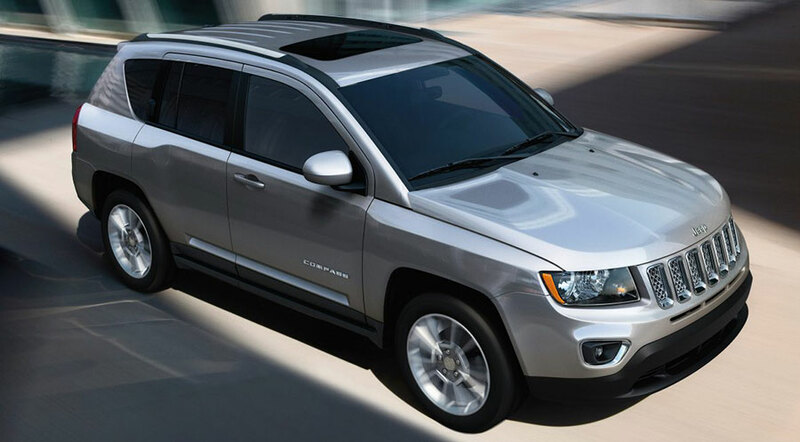 As you roll through rocky terrain, the 2017 Jeep Compass keeps you feeling comfy and secure. This crossover is small enough to navigate cramped parking lots with ease, but, inside, it’s never short on passenger space. The leather-wrapped steering wheel and leather-trimmed seats add a splash of luxury to this Jeep’s rugged ride. In this segment, the 2017 Jeep Compass leads the way in off-road performance. You’ll be hard-pressed to find another small crossover that provides four-wheel drive with low-range gearing, which supplies greater driver control when you’re moving through especially rugged territory. The Compass combines impressive engine output with modern fuel economy, earning up to 23 city/32 highway mpg. (http://www.fueleconomy.gov/feg/PowerSearch.do?action=noform&path=1&year1=2017&year2=2017&make=Jeep&baseModel=Compass&srchtyp=ymm) When you head off on your next off-road adventure, you can count on the Compass to make the most of what you spend at the pump. Even when you veer off the beaten path, the 2017 Jeep Compass keeps you connected to friends and family. The Uconnect infotainment system is one of the best available, with a touchscreen that’s quick to respond and menus that are easy to navigate. Uconnect also includes Apple CarPlay and Android Auto – modern technology that displays smartphone apps directly on the Compass’s central touchscreen. Now you can have the system read your texts aloud or give turn-by-turn directions via your Google Maps app. Safety is on your side in the 2017 Jeep Compass. The forward collision warning system uses radar for constant feedback on nearby traffic. If it senses an oncoming crash, the system does more than warn you – it can actually apply the brakes to bring you to a quicker stop. As you travel busy highways, the blind-spot monitor alerts you to any vehicles in your blind spot. That way, you avoid dangerous sideswipes. The Compass Trailhawk offers layer upon layer of premium options, everything from active safety features like rear cross traffic alert and side blind spot alert to comfort options like heated steering wheels and heated and ventilated seats. 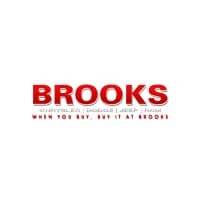 Nearly anything you can think of in the array of potential features can be found in the Compass Trailhawk, including leather interior, all-wheel drive, plenty of leg room, and a hands-free power liftgate that makes any cargo easier to haul. If you’re looking for the luxury option, the Trailhawk is the model to choose. 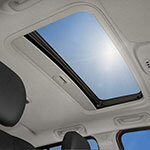 Make your driving experience an open-air option with this available option, which retracts to bring the sunshine and outdoors in. 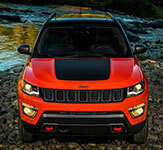 With a seven slot style that hearkens back to the history of Jeep, the signature grille gives the Compass an unmistakable look. This touchscreen combines Bluetooth connectivity with Siri Eyes Free and access to apps to make it easier to stay connected and safe while driving. 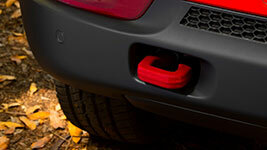 Both practical and stylish, these bold red tow hooks offer options for your off-road adventures. For adventurous drivers, the 2017 Jeep Compass provides an affordable ticket into the great unknown. All-wheel drive with low-range gearing delivers the means to tackle rugged trails while high-tech safety gear offers protection you can trust. The Compass adds a level of luxury to its rugged capability, creating a crossover SUV that ought to top the list of the best small SUVs on the road (or trail).